Special order. No cancelations or returns. 3-10 day lead time. Advanced LXT (low-extractable) material significantly reduces leachable contamination compared to conventional PVC and other pipingmaterials. Complete line of pipe, fittings and valves IPS sizes 1/2 - 6 diameters. Proprietary one-step fast setting joining method reduces TOC contamination and rinses up quickly. Strong Schedule 80 dimensions for pressure service. Exceptionally smooth interior walls reduce particle contaminants. Fast, reliable installation with simple, inexpensive joining methods. Unique blue translucency enables visual inspection of joint integrity. Good chemical/corrosion resistance, high-impact strength, low thermal conductivity. Bagged, sealed and boxed on-line for use in a high-purity environment. Both socket and threaded end connectors are provided with valve sizes 1/2 - 2 Ball Valves. Socket end connectors are standard on 3 & 4 valves. 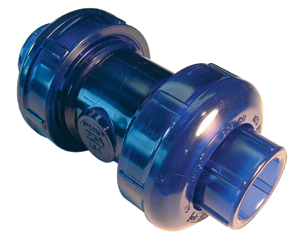 Valve size 1/2 - 2 carry a maximum pressure rating of 235 psi for water, non-shock, @ 73 F (23 C). Valve sizes 3 & 4 carry a maximum pressure rating of 150 psi for water, non-shock, @ 73 F (23 C).